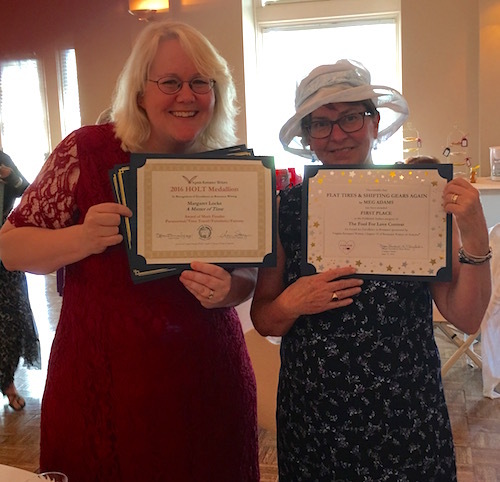 The Virginia Romance Writers‘ second annual awards luncheon kicked off in festive spirits (and with lots of hats) as we celebrated our members’ and contest winners’ accomplishments in tea-party style. A big thanks to Jacqueline Bragaw, our hostess extraordinaire, who planned and decorated everything with great finesse! 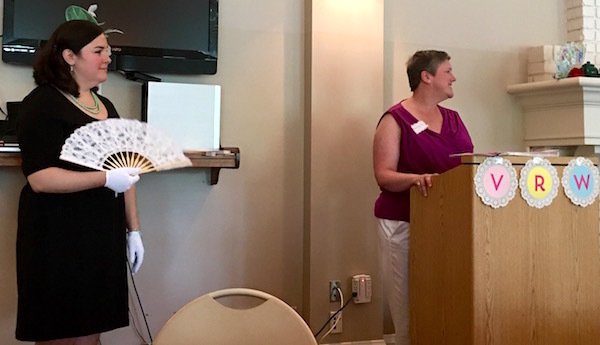 VRW President Stephanie Gurnsey Higgins welcomes us all, while dapperly dressed event planner Jacqueline Bragaw looks on. Yes. You should be jealous. 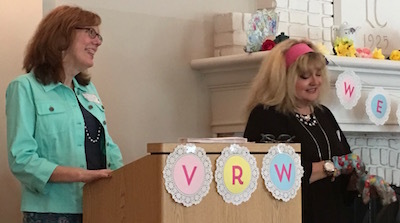 VRW’s president, Stephanie Gurnsey Higgins, welcomed us all before we feasted on a delicious meal and even more scrumptious desserts, provided by VRW’s very own Amy and Carolyn. 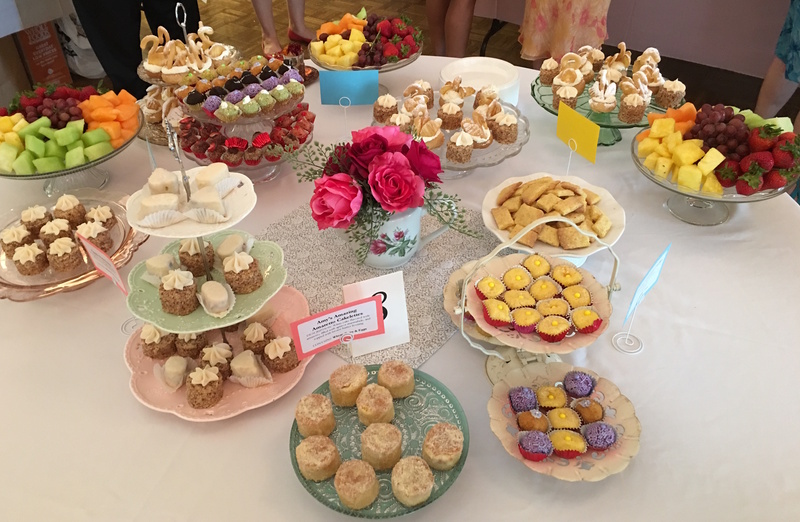 Yes, there was much oohing and ahhing – over the taste as much as the presentation! 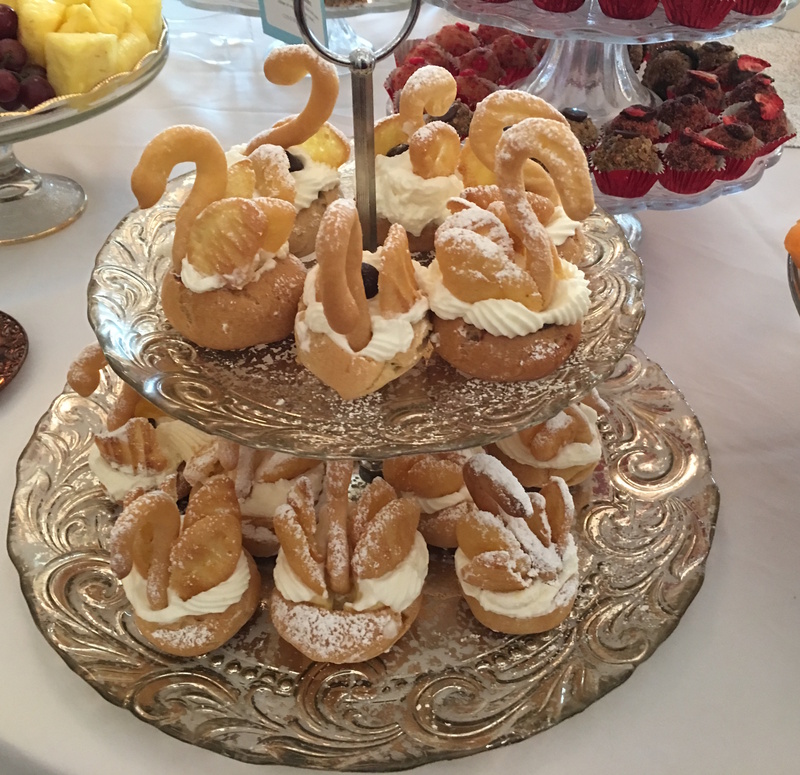 We all swooned over the swans. Another special treat was listening to VRW founding members Carolyn Greene and Cynthia Holt Johnson (for whom the HOLT contest is named!) discuss the history of our chapter (newsletters copied at Kinkos and sent via the good old-fashioned mail? Janet Evanovich and Cathy Maxwell and so many other big names? You bet!). 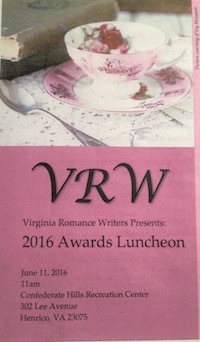 They encouraged us to move forward in our writing with AUDACITY – the same audacity VRW showed by calling themselves the Virginia Romance Writers when the original members all hailed from Richmond, by launching the Fool For Love contest to encourage unpublished writers, and by establishing the reader-judged HOLT Medallion contest. Go, Virginia Romance Writers! Meg Adams and I showing off our certificates. Then came the grand finale – the announcement of the Fool for Love and HOLT Medallion winners. I’m so pleased fellow VRW member and writer friend Meg Adams took home 1st place in the Fool for Love contest in the Published Authors division, and it was such a thrill to share in the excitement and giddiness of the other winners. Thank you to the Virginia Romance Writers for all they do in supporting all of us in our writing careers. What a fantastic group of people, and I’m so proud to be able to say I’m a part of it. 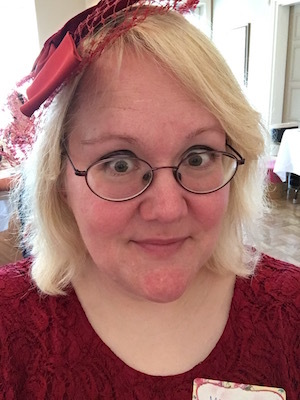 I look as startled as I felt to be garbed in a fancy dress – with a fascinator!